One of the major tech parks along the Sarjapur Outer Ring Road, there’s plenty for you to do within Ecoworld which involves looking at art installations to getting a pedicure or even a haircut. Read more about that here. We love the Bombay Brasserie here — poolside, romantic and ideal to grab dinner post work. We’re also thinking date night here. Over at Ecospace, skip out of the office and hit up Big Brewsky or poolside chilling at BG’s Bar & Grill. If you are looking for some team bonding activities or just chilling out with your colleagues, hit up Red Riders for their trampoline bungee jumping and rocket ejectors. Or you could head straight to Play Arena to try over 30+ activities that range from skateboarding to paintball. Post work at either of these colossal tech parks, you can check out these cafes are restaurants in and around the area. Folks working out of these two tech parks in the Marathahalli area, you can start off with sorting out your 4 pm cravings by embarking on a culinary journey through India at this street food lane. They serve everything from litti chokas to rasgullas. For after work scenes, you’ve got Dive Bar and Foxtrot to hit up for drinks and dance. Since there are a lot of factory outlets on that side of the town, come salary day, head to these Nike, Adidas, and Reebok factory outlets to pick up anything from sports shoe to athleisure. 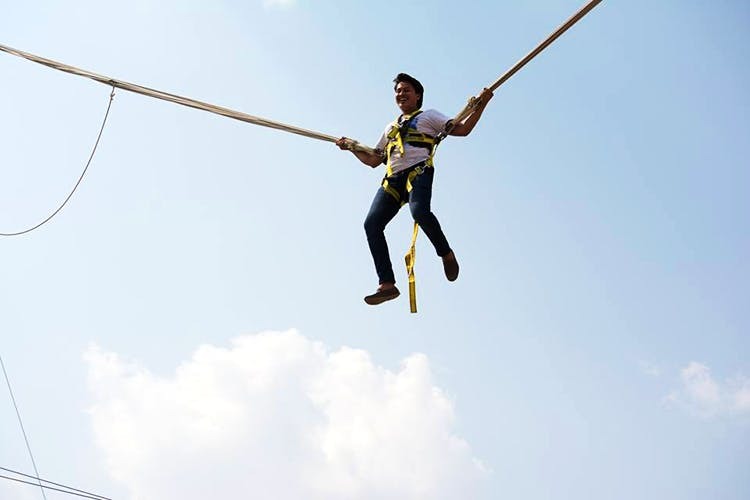 Active Arena is for all you folks looking for that rush of adrenaline as they are open 24/7 and also boast of the highest zip line in the city too! Old Airport Road might not offer much in terms of activities or even good places to eat, but you have got yourself Starbucks for coffee and the 3 Monkeys Brewpub just opposite the tech park for some craft beer. Also, Le Casse Croute, the French food truck parks itself at the tech park all weekdays, during lunch time, so there are sandwiches and fries to look forward too. Gopalan Signature Mall should satisfy any and every mall rat. The mall also has a bowling arcade, maybe go for a couple of rounds with the office peeps? Scoring a strike has its fun! Or you could watch a movie at the mall’s theatre. Not so bad as you think. Indiranagar is quite close by too, if you take the metro, and you know there’s plenty to do in Indiranagar. Folks at Manyata if you are looking for a spot of fresh air, head to Lumbini Gardens, a cultural landmark in Bangalore. The mini amusement park is the perfect spot for picnics and games. Plus, it also has the city’s only floating restaurant. An institution in itself, do not miss out on JCK Momos for their chilli cheese, prawn, and melt-in-your-mouth-paneer momos. With rooftop football and racing simulators, Sports X is for you to check in after work hours! You can head to Courtyard By Marriott Bengaluru Hebbal for a staycation and enjoy their lavish buffets and infinity pools. There’s Howard Johnson that’s perfect for business or staycation as well. Indiranagar is the closest place for folks who work out of these two tech parks. Sure, Embassy people might say that Koramangala is close too, but when you’ve Toit, 612 East, or even Loveshack for that matter, you don’t need to make that Koramangala trip to be high and happy. Bagmane people, we are guessing you already know about the mini street food lane outside your tech park, so we are going to tell you more about what you can do in Indiranagar. There is Mystery Rooms and Amazing Escape riddle-solving group games for you and your work buddies to solve. Oh, and all those folks playing Secret Santa or looking for a birthday gift, look no further than The Quirk Station that stocks up on all kinds of gifting options. Team lunches at The Fatty Bao, 1131 with their 20-inch pizzas, and Burma Burma come highly recommended. Also, don’t miss out on the coffee at Third Wave Coffee Roasters.